The SOG Tomcat is an awesome knife. It is a heavy duty folder with top level materials and manufacturing quality. This latest offering has textured Carbon Fiber handle material and is truly the finest Tomcat we have seen. This is a great product! 1 7/8″ diameter. 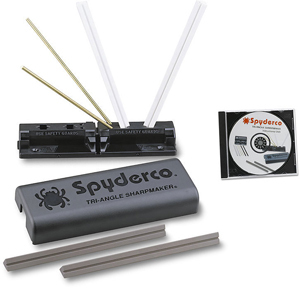 Hand-held rolling wheel knife sharpener has two slots with proper built-in angle to sharpen each side of the blade. No lubricants needed. Compact and easy to use. Made in Brazil. 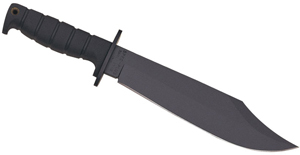 We have tried this little item around the warehouse here at the KnifeCenter- and we like it! It does a reasonable job of quickly setting the angle on both sides of a blade. Use it gingerly and try to work the entire edge and carefully keep it lodged in the groove to keep the angle consistent. One of the nice features is that it doesn’t mess up the sides of the blades with scratches and just works on the sharpened bevel. Generally we follow it with a quick stropping- just drag the blade pretty much flat on some leather or even canvas or blue jean material to take the extra steel off the edge on both sides. Art of War is a new line of well designed combat knives. They have learned from all the combat knives that have preceded them and put together a great selection of both fixed blades and folders. They all feature top quality 440C stainless steel blades with black titanium nitride coating for abrasion resistance and G10 handles. So, the materials are all 1st rate. Then the designs seem to be time tested classics with double guards built in to the folders as well as fixed blades and all the goodies one expects with modern combat knives. Sheaths on fixed blades have a notch cut out to allow for cord cutting with the knife still sheathed. Slots on the sheath allow for multiple carry methods. Handles are grooved for better grip. Then there are lots of other features including a limited lifetime warranty. One of the best features, however, is the incredible pricing they are offering. You can get a lot of knife for a really reasonable investment. Sometimes you don’t want to carry a $200 knife- you want something that, if you lose, you can order another without blinking. Outdoor Edge focuses on hunting tools and offer the best variety anywhere. This kit should serve the purpose and we highly recommend it. RAT Cutlery is producing some awesome products. These orange Micarta handle knives are great as knives you want to take into the field. The orange color will help keep them in your possession- the number one way to lose a knife is to leave it in the field. The bright color could mean that the knife will last 2 or 3 times as long. Consider it a real bargain! Thiers-Issard Straight Razors – the finest! We got in a new shipment of the wonderful Thiers-Issard razors from France. These are considered by many to be the finest razors in the world and we are proud to offer them. 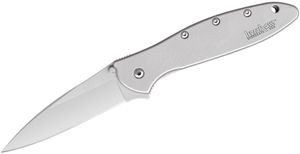 The Eagle brand is exclusive to the KnifeCenter in the US and the fileback model J86 is also exclusive. These are mostly old forgings meaning that they were made years ago and are just recently ground and finished to become razors with unmatched hardness and sharpness. Check out the variety of Thiers-Issard we have as well as the ShaveCenter for all of our great shaving accessories.